Seems B&L are to close this site in Cardiff. Shame that, as always enjoyed their lobster. Can’t say they didn’t try everything with multiple menu changes, but seems not to have found favour with enough Cardiffians. It seems B&L have bowed to the inevitable (who really went for the £20 burger) and (for Cardiff alone) have moved their menu away from the simple burger or lobster model. 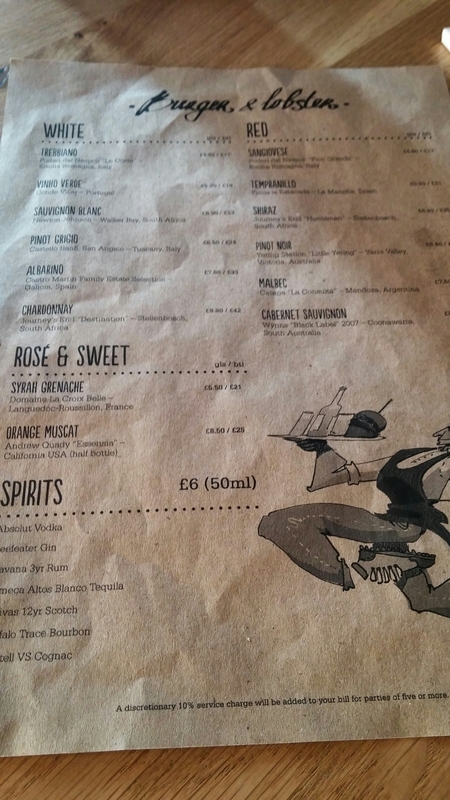 I couldn’t make the launch events for the new menu so can’t comment on the actual taste, but Gourmet Gorro has the lowdown on what it all tastes like – very good it would seem. I have set out below a few thoughts on this move. You can now get more choice with stuff like a brisket roll (brisket seemingly becoming the new pulled pork in terms of its ubitiquousness) and cheaper burgers from homegrown beef or lamb (the beef burger and brisket are a seemingly reasonable £8, the lamb an extra quid). 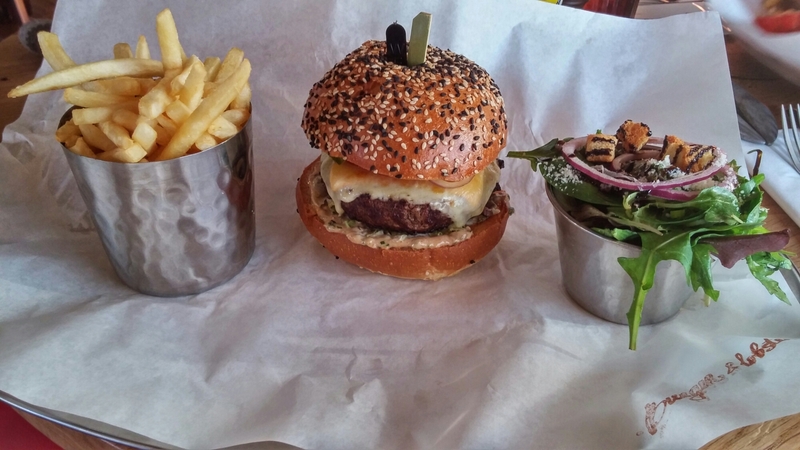 The old £20 Nebraska corn feed beef burger remains but is now a more palatable £15. You do get fries and salad with the £15 one, but don’t seem to with the cheaper option ones (with adding sides – chips etc bumping up the price). Lobster is still available with new sized options. For £24 (up from £20) you get a 700g one (which includes fries, salad and a sauce ) and for £18 you get a 500g one. It is unclear what if anything – chips etc. – comes with the smaller one, but my reading of the menu is they are extra. 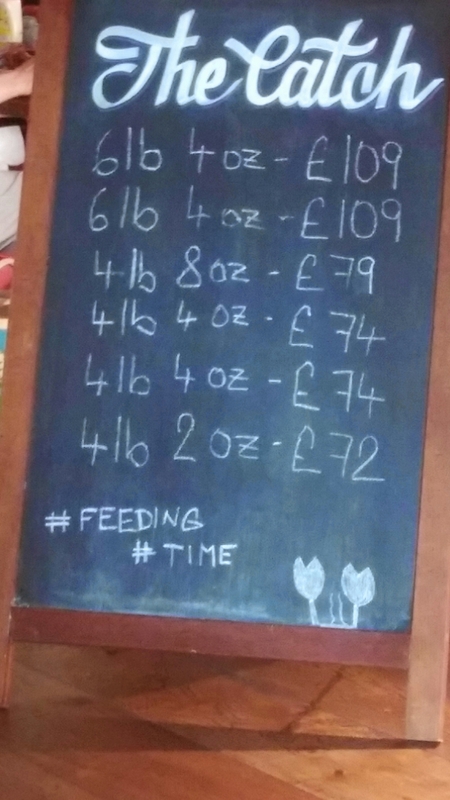 If no sides are included, the pricing seems a bit odd as if you have to add fries and a sauce that would take the 500g lobster to £22.50 (uncomfortably close to the £24 price of its 700g brethren which comes with fries, sauce and a salad). I kind of think it is a shame that the base B&L model hasn’t worked in Cardiff, as I was happy to have my lobster subsidised by burger eaters, but then again I always thought a £20 burger was never going to work out in Cardiff. The lobster prices seem to have gone up though as a result and it looks like the cheaper options may not be quite as cheap as they first appear (if you have to factor in the extra cost of sides). Still looks pretty good value mind. I would probably still only go to B&L for the lobster and the result of these changes is I will have to pay more if I do – so not great for me. One thing it does is make the prices at Shake Shack look even more inflated and unjustified in the Cardiff market. Below is what I thought of the original B&L model in Cardiff which is the one that remains in operation in their other outlets (at least for the moment). 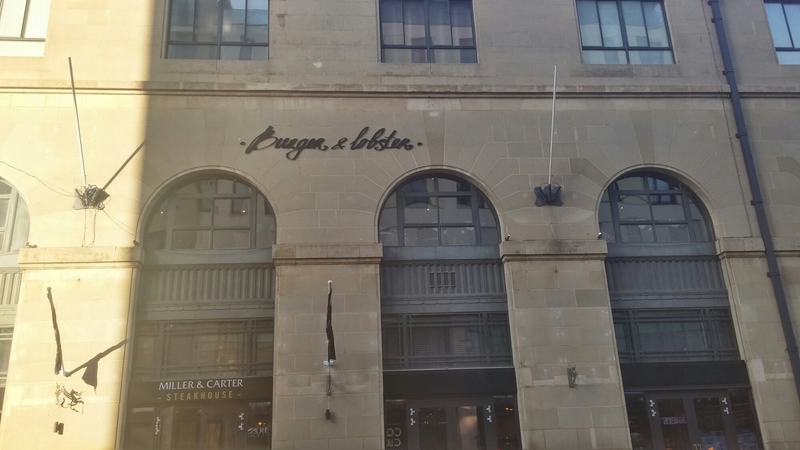 The new Burger and Lobster (B&L) in Cardiff operates on a very simple premise. There is no menu per se as it’s either lobster (in the shell or naked in a lobster roll) or burger and that is basically it. 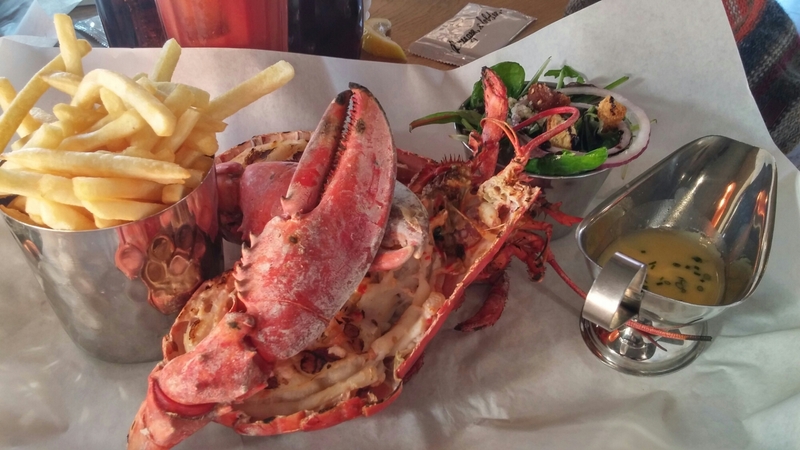 If you don’t like lobster (what is wrong with you – must admit whilst love lobster if had choice would probably go for crab over lobster! ), well it’s the burger for you and if you don’t like burgers (again what is wrong with you), well this ain’t the place for you. I like simple (I can relate to it), with long menus making me instantly suspicious (risk of jack of all trades, master of none) as well as usually chronically indecisive. B & L was, therefore, an obvious choice for lunch with J, with both of us working between Christmas and New Year. A bit of what would appear to be affordable decadence to assuage the pain of being part of the skeleton crew in a near deserted office whilst everyone else is off enjoying an extended break. We were joined by who I shall call new girl (she has been with the team for nearly a year, but when you have worked in a single place as long as I have pretty much everyone is new). New girl brought with her the somewhat dubious benefit of not eating anything that mainly lives in water (I kid you not). On asking the personnel department in work, they advised me is was not possible to sack someone for this offence (and way above my pay grade to do so in any event – no harm in asking I thought)! 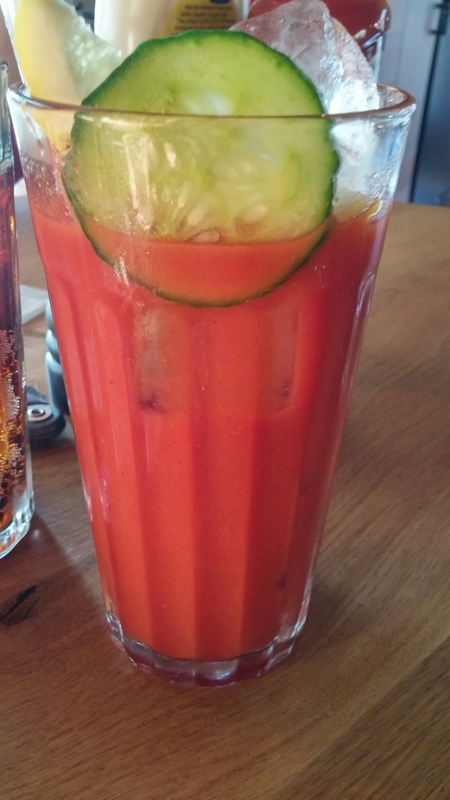 Normally I would regard this as very weird, bordering on the insane (I have told her this many times), but for this blog piece it was a positive boon as she could have the burger thus removing the inevitability of me having it if just J and I had gone. I was told by J in no uncertain terms that if I wanted one of us to have the burger it wasn’t going to be her. So with the three of us we could take out the menu in full (lobster and burger) with no sacrifice on my part. Inside it really is a lovely space. I am not normally one to care much as to what a place I eat in looks like (or indeed what I look like in the places I eat), as to me it is all about the food. This is, however, a really nice place for a feed. Situated in the whole of what was previously the top floor of Habitat, they have retained the best architectural features and added in a nice interior. There is also a rather nice bar area where you can just have a drink. All very plush and swanky. New girl, as promised, went for the burger but then ruined it by asking for it “well done” (blasphemy in my view – I checked with personnel and they said no, again). J and I both went for the lobster (in shell) steamed and grilled respectively. With the burger you get offered gratis (I should bloody well thinks so at £20) bacon and cheese, if you want them. New girl declined bacon (third heinous food crime, in my view) and just went with cheese. The burger was a good looking beast and the patty looked to have a nice texture (not dense). It had a good flavour according to new girl, and from the morsel of it I had it was ok, if unremarkable. It is, however, tricky and perhaps unfair to judge the quality of a burger when it has been nuked (on request rather than in error) and it would undoubtedly have been a lot better if it had been cooked to a medium rare. It wasn’t, however, in either mine or new girl’s view a £20 burger (I doubt it would be even if it were cooked pink to my taste). To justify this price it would need to be really mind blowingly good. To be honest I can’t see why anyone would order it over the lobster unless they didn’t like lobster. I love both lobsters and burgers, but if they are at the same price point there is, to my mind, only ever going to be one winner (lobster). On to the lobsters, both where a decent size (gawd only knows how many the 6Ib plus ones on the “Catch of the day” board feed) and for the £20 price tag, I think, very good value. The grilled lobster I had was nicely cooked to just the right level of doneness (over and you get rubbery meat) and it had a decent amount of tender meat in it. The meat wasn’t as sweet as other lobsters I have had (most notably one at Manuka in Aberaeron), but at the price of £20 for a good sized meaty whole lobster it was pretty good. The claws were pre-cracked so whilst you got implements (nut cracker and a pick) to access the meat in them, the only one really needed was the pick. It was a relatively simple exercise to get at the meat in the claws etc. 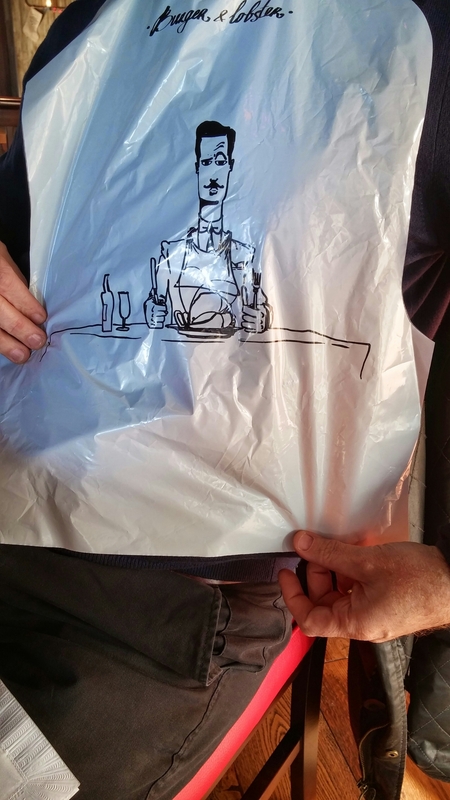 (I know some people are put off by the need to root around with a lobster – I personally love it ) which resulted in the unflattering lobster bib being largely unnecessary unless you are a messy eater . My stylish lobster bib – I am a messy eater. Where more effort is required I usually get bits of lobster in what little hair I have left. The fries where nice enough, if fairly regulation McDonald style, and the lobster (and burger) came with a really rather good, well dressed, side salad. You can have either a straight butter sauce or a lemon and garlic butter sauce with your lobster and both J and I opted for the latter. This had a good flavour to it and was great for dunking chunks of lobster and the fries in it. 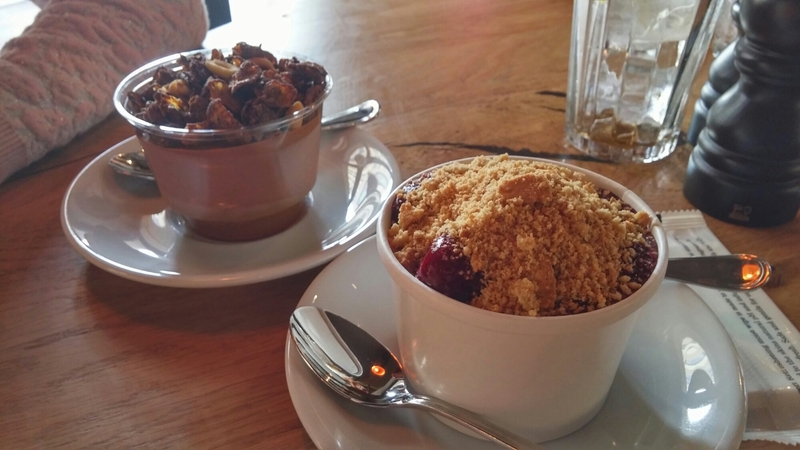 We shared two desserts between the 3 of us, in the form of a snickers mousse and a sort of upside down, loose, berry cheesecake (£4.50 each). There were the only desserts options available. On the drinks front they have a well formed cocktail list (split between burger and lobster cocktails) and a short, but reasonable well chosen, wine list (bit on the pricey side for what is on it mind). As it was a working day alas no booze for me, but they had an ok selection of “soft shell” drinks and I had a lovely, spicey, Virgin Mary which would have been killer with a slug of vodka (and sherry – l like a bit of sherry in my Bloody Mary) in it. 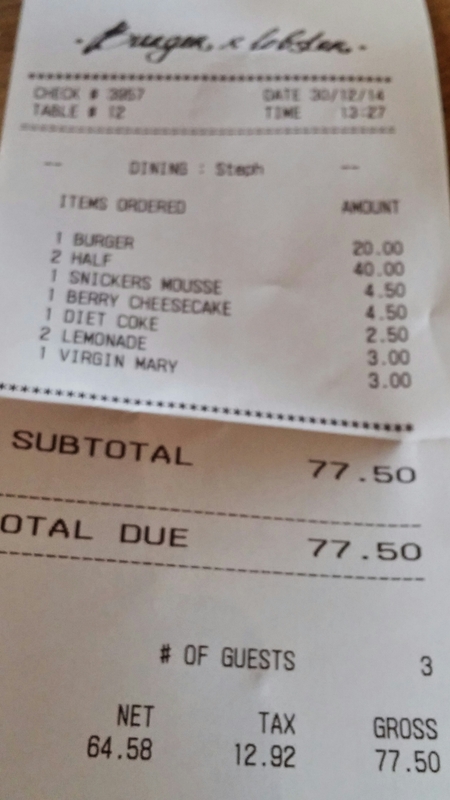 The damages was pretty reasonable (especially if you replaced the burger with another lobster) at £77.50 for the 3 of us. We remembered to pay, unlike some it seems! Service was good – efficient, but friendly without being obtrusive. I am sure it has been done to death, but here is my two penneth worth on B&L’s pricing policy. 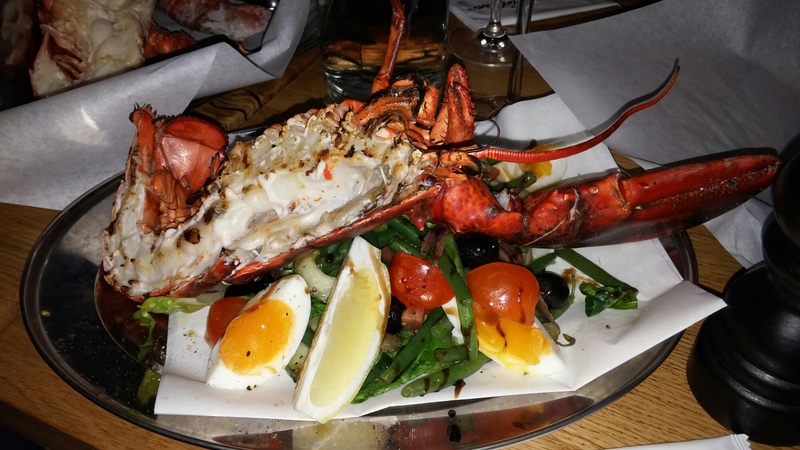 I get the great value that is a £20 whole lobster, but I just don’t get the £20 burger. I have been told it is to keep the prices simple (everything is £20) but that can’t be right as you can buy (at a steeper price) a bigger than the standard 1lb £20 lobster. The other rationale for the £20 burger would be that it is the best burger ever, but Goodman , who I believe own B&L, have a burger on their menu which is (all in with fries etc) priced at £15. Now, as a high end steak house, are Goodman really going to be selling an inferior burger to that sold at B &L? I have now tasted burgers from both (albeit only a tiny bit of new girl’s B&L one) and can’t say the B&L one was better than the Goodman one (although the B&L one did suffer from the request from new girl – despite my protestations – for it to be cooked well done which never shows a burger at its best). To be honest, neither are close to toppling the dead hippie as my favourite burger. My conclusion is the burger eaters at B&L are subsidising the lobster eaters. You pays your money and takes your choice I suppose. Cheers, therefore, to the burger loving/lobster hating guys and girls out there for subsidising my very nice lobster. To me you would be mad to order the burger (something I told new girl repeated before, during and after the meal). On my visit, however, I noticed plenty of people seemed to be ordering both then going half and half. This only works, mind, if your dining partner likes their burger done the same as you. I am very particular as to the doneness of my burger. Sharing with new girl would have, for instance, been a disaster and Mrs. SF does not share my blood thirstiness when it comes to beef. Not really an option for me the sharing marlarky. All in all, both J and I thoroughly enjoyed our lobsters. New girl less so her burger, in part self inflicted due to her asking for it be nuked. Her rationale was that it would come medium if she asked for it well done as burger are always undercooked (not in my experience they aren’t, have to say). B&L, however, true to their word cooked it exactly as ordered which bodes well for those who like their burgers cooked properly (i.e. medium rare). Would I go back? Yes, I would. I love a bit of lobster and to get a good whole one with sides for £20 is excellent value for what is still very much a luxury item. I, however, am not sold on the £20 burger. 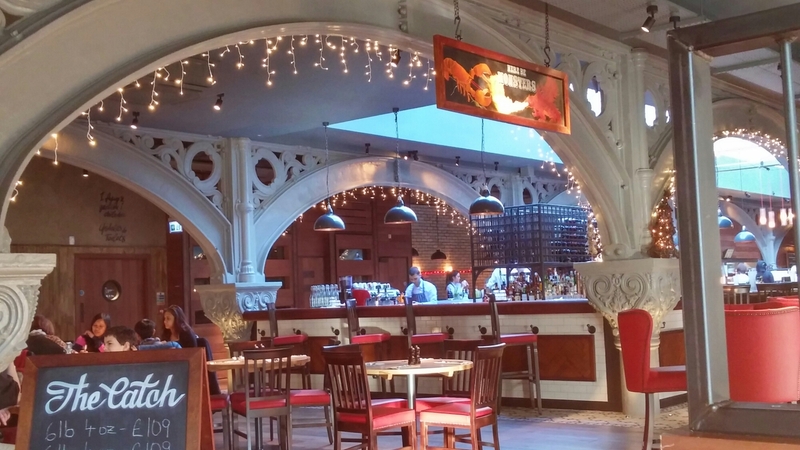 Since my visit, B&L in Cardiff have introduced a £12 lunch menu (available Monday to Friday). 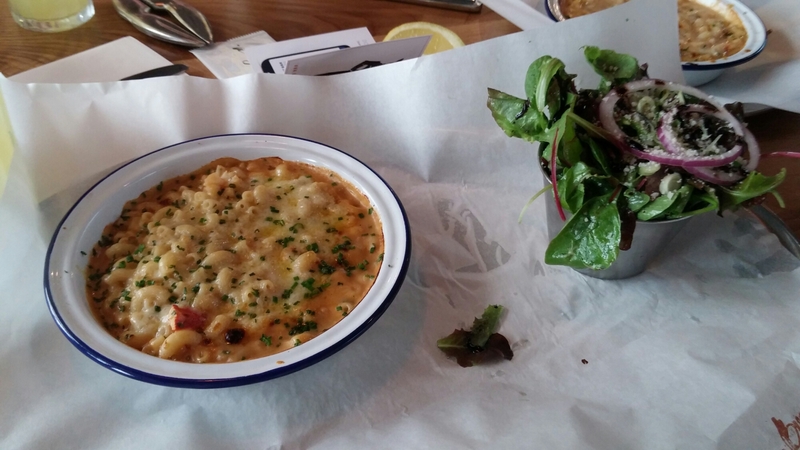 This very welcome change in tack from the £20 model (great for dinner but pricey for lunch) includes a lobster mac & cheese, a half lobster nicoise and a smaller 6oz burger. A lunch with friends covered all three, with my choice being the Mac & Cheese. A very satisfying dish with a great cheese sauce full of lobster flavour and spiked with chunks of lobster. It came with the usual very good B & L salad. A great piece of decedent comfort food at a reasonable price. The nicoise was also very good with a nice half lobster (grilled or steamed) and all the components of a good nicoise salad. The 6 oz burger also looked good (demolished before I got the chance to take a photo). Still a decent size (more than enough for lunch) and much more palatable price wise at £12. It came with fries and a salad. All in all B&L’s new lunch menu is a very welcome addition to Cardiff’s fixed price lunch offering. I will be back. “New Girl” sounds like a…err…character! Great review mate! Enjoyed the review and had to agree with most, if not all, of it. I went along with a couple of the SuperBurgerBros team and ended up with the lobster roll as I refused to be part of a group handing over £80 for 4 burgers…..despite the burger being the sole reason for the visit. How many reviewers does it take to review 1 burger with bacon and cheese anyway? The lobster roll was really good. Still trying to work out if I can justify putting it on the Super Burger Bros blog, probably not. I had the lemon and garlic butter and opted out of the wasabi offering (I wasn’t sure if it would be too much). I’d definitely be back, but only for more lobster, but then again, I will need to review that burger at some point. 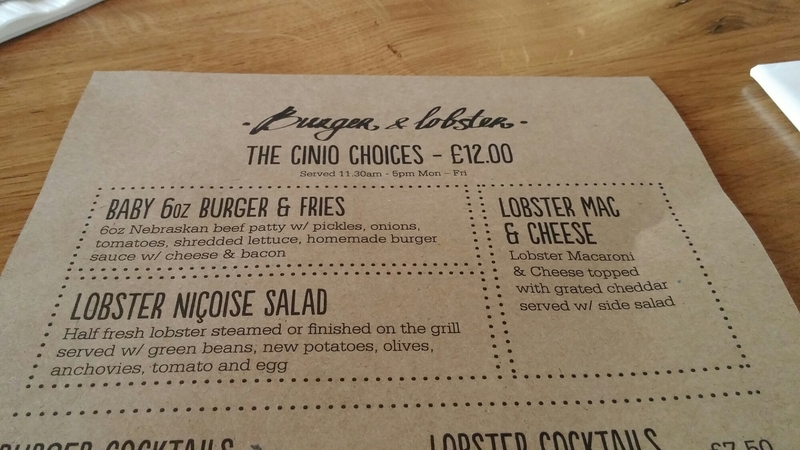 Shame not to 😀 – they will split the burger and lobster (if order both) if ask them so can go half and half proper Cardiff style . 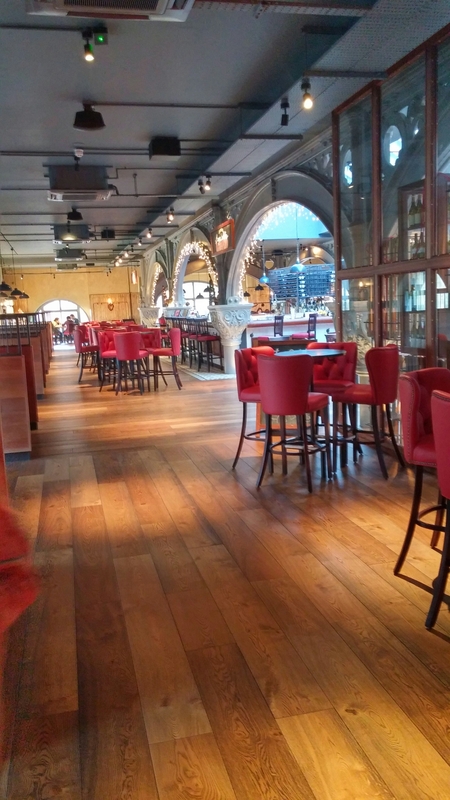 This entry was posted on Jan 4, 2015 by solicitingflavours in Burger, Burger and Lobster, Cardiff, Drink, Fixed Price Menu, Food, Food and wine products, lobster, lunch, lunchtime, Restaurant Review.